Details remain spotty, but early reports indicate a U.S. drone strike was carried out on a terrorist training camp in Somalia just as a very large group of fighters had amassed. Sources told the Washington Post and other outlets that the targets planned to attack U.S. interests in area. The camp, which was tied to the notoriously brutal African terror group Al Shabaab—a group that actively aligns itself with ISIS—was located about 120 miles north of Mogadishu. It had been under surveillance for some time before the strike was authorized. The final call came as intelligence showed that the fighters at the camp posed an imminent threat to the small group of U.S. special forces deployed to Somalia to advise and assist Somali and African Union troops. NBC reports that its sources state the strike was largely prompted by a strange scene at the camp. A large group of fighters was in formation, conducting what appeared to be a ceremony of some kind. Some sort of ritual and/or prayer before a planned operation may have given the unmanned aircraft overhead the perfect opportunity to strike with maximum results. Still, 150 plus militants killed without any known civilian deaths is an amazing statistic for a drone. The MQ-9 Reaper commonly carriers a load of four AGM-114 Hellfire missiles and a pair of GBU-12 500 pound laser guided bombs. If the majority of the fighters were packed together in the open, this is enough firepower to have significant effects, although it is probable that other aircraft were involved, including manned fighters. It remains unclear if any of Al Shabaab’s top leadership were taken out in the strike, or exactly what type of attack the group had planned. Additionally, we don’t know if any fighters are thought to have escaped the drone’s crosshairs. 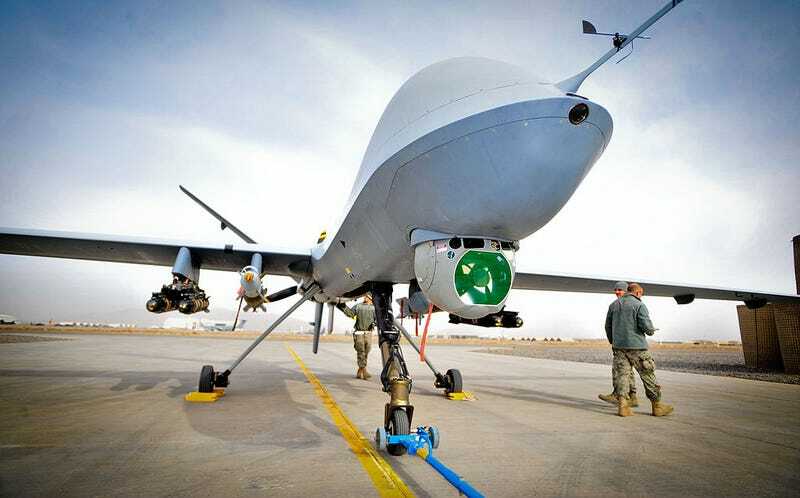 American unmanned aircraft operations are quite the norm over Somalia and the Horn of Africa. These aircraft are based primarily in Djibouti, along with special operations aircraft, namely CV-22 Ospreys, as well as other aircraft belonging to multiple U.S. governmental agencies. In the past, a detachment of U.S. Air Force, Navy or Marine fighter aircraft have also been based at the sprawling African outpost. These fighters were mainly used for contingency operations during America’s involvement in counter-terror operations in Yemen. Now that these operations have largely ceased, this capability could have been retained for attacks just like the one unveiled today. Will will keep you updated as more details on this strike unfold.